Raith Rovers fell four points behind league leaders Arbroath after being held to a disappointing 1-1 draw at home to bottom of the table Montrose. Rovers had to come from behind, relying on an own goal from Iain Campbell to preserve their 17-month unbeaten league record at Stark's Park after Graham Webster had fired the visitors into a half-time lead. The match was Kevin Cuthbert's third in caretaker charge, and while Barry Smith's former no.2 has impressed with the professional manner he has handled a difficult situation, the failure to pick up three points for the second consecutive Saturday may hinder his chances of landing the job on a permanent basis. His cause was not helped by yet more terrible luck with injuries as goalkeeper Kieran Wright barely lasted five minutes, while starting midfielders Grant Gillespie and Ross Matthews both limped out of the action either side of half-time. Raith's injury curse just goes on and on. The enforced changes saw the home side finish with six attackers on the pitch, but with little balance or coherence to the side, they were unable to link up effectively and apply the sustained pressure required to turn one point into three. Cuthbert made two changes to the 11 that started the 1-1 draw at Brechin the previous week, with Chris Duggan and Liam Buchanan both dropping to the bench; Lewis Milne and Nathan Flanagan taking their place in the starting line-up. The interim boss also stuck with his 3-5-2 formation but the lack of natural attacking full-backs resulted in a lop-sided system that carried little threat down the right via defender Euan Murray, but little protection down the left via the attack-minded Flanagan. Cuthbert has taken a bold approach to his time in the dug-out, using the opportunity to put across his own tactics and ideas, but the question now, after two draws, is whether he may have been better served taking a similar approach to the one that secured a 4-0 win over Forfar in Smith's final match in charge. However, the choice of system could hardly be blamed for Raith's sloppy start to the match, which effectively came down to the players themselves failing to set the tempo and allowing an aggressive Montrose side to win their battles and get on the front foot. 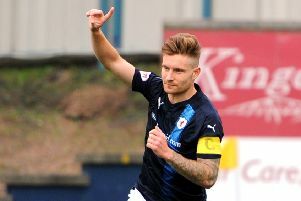 Raith were forced into an early change when a high-looping cross into their box saw 'keeper Wright come off his line, only to be clattered by striker Martin Rennie. The on-loan Rangers stopper required treatment, and lasted only another few minutes before signalling to the bench that his game was over as he clutched his shoulder. Robbie Thomson stepped off the bench to make his first appearance since picking up an injury in the defeat at Cove in July. While Rovers seemed hesitant and unsure, the visitors were holding nothing back as they pressed for an opening goal and, with his first involvement, Thomson was required to get a vital glove to take a cross off the head of Rennie, before Webster fired wide from the edge of the box. Rovers first threatened on 17 minutes when Lewis Vaughan, up front with Kevin Nisbet in a new-look attack, turned a defender 20 yards out and shot just wide. But that was the rare highlight of a laboured first half, and Montrose made the most of their growing corner count by scoring the opener on 28 minutes. Slack defending from a set piece cost Raith two points in Brechin the previous week, and it proved their Achilles heel again as Campbell's near post delivery was flicked home by Webster, leaving question marks over the marking. Rovers then lost Gillespie, who went into a full-bloodied challenge only to come off worse, with Duggan coming off the bench and, in a sense of deja-vu to last season, Vaughan, somewhat frustratingly, finding himself back in midfield, often as the deepest sitting player, completely nullifying the league's most dangerous forward. Montrose were good value for their half-time lead and Raith required a change in mentality, if not approach, for the second half. Cuthbert's half-time team talk did not alter the system, but it did seem to provoke a reaction as the team got into a huddle as they returned to the park, and within 15 seconds of the restart, Raith had won the ball back and Nisbet let fly from 25 yards with his effort only narrowly wide. Nisbet was involved again five minutes later with a defence-splitting pass picking out the run of Duggan but goalkeeper Jordan Millar was quick off his line to make a block just as the Raith striker got his toe to the ball. After a flat first half Rovers were now making some headway but the woodwork came to their rescue on 53 minutes when, again from a corner kick, Rennie looped a header towards goal that Thomson finger-tipped onto the bar. Flanagan and Milne were both denied by last-ditch blocks as Montrose protected their lead, but the visitors were a bit more generous in their defending on 56 minutes when Flanagan got a shot away, Millar parried, but only to Matthews, who knocked it towards the gaping goal, only for Campbell's attempted clearance to end up in the back of the net. With relief at the equaliser, and over half an hour left to play, the hope - and expectation - among the home fans was that their team would now go on to win the match. However, whether it was the system, the personnel, or both, Raith just couldn't get the ball into the areas they required to hurt Montrose despite having Nisbet, Duggan, Flanagan, Vaughan, Milne and Buchanan all on the park for the final 20 minutes. Cuthbert's fate is now in the hands of the board of directors, who need to decide whether to stick or twist. Either way, the club needs a permanent manager in place this week to end the current uncertainty that is helping no-one.